Fleegle is out sick again this week--felled by a nasty broccoli bronchial infection. Fortunately for my faithful readers, I don't have any broccoli bronchi, so I offered to fill in. I am so thoughtful, considerate, brave, trustworthy, loyal, friendly courteous, helpful, friendly, kind, obedient, cheerful, thrifty, brave, clean and reverent! I've been resting on my laurels since my last fantastic creation (Lavori #5, page 14)... well, actually, I've been resting on my waterbed...but you get the idea that I am resting. As you can see, Ninjin (carrots, in Japanese) is fairly fearsome. The other day I pointed him at a fruit fly in the kitchen and the next thing you know, he cuddled the buzzy little irritant to death. Ninjin will be on his way to Japan soon, where he will become the Chief Enforcer in Tonya-san's household. And folks, keep those cards and letters coming! *This pattern can be found on page 8 of Ondori Organic Cotton Knitting, ISBN 978-4-277-17190-8. I think it's out of print, because I can't find it anywhere. The yarn used was Classic Elite Yarns Premiere, one skein of lavender with bits of purple and orange for the eyes, nose, and tail. Harry danced in the door the other day, his propeller beanie twirling madly and a smirk on his face. He tossed his new masterpiece onto my lap, instructing me to post the photos and heap on some praise for his knitting, creativity, and utterly magnetic personality. While I am obeying his first order, I shall leave the praise to the readers of this blog. Until he returns the skein of cashmere/alpaca/silk snatched from my hands before I had even finished unwrapping it, I refuse to say anything nice about him, his knitting, or his magnetically repelling personality. Flipping though his raspberry smoothie-spattered notes, I see that this design is called Copritavolo (tablecloth) and appears on page 14 Lavori Artistici a Calza #5. Harry used #4 needles and the carefully hoarded Vermilion Malabrigo lace yarn that I had forbidden him to touch. The directions called for doubling the outer leaves in alternate sections, but Harry doubled them in all the repeats--he says it makes the design looks more fluid and, much as I hate to be seen agreeing with him, I think he definitely has a point. Harry must have adored the Malabrigo lace yarn, seeing as how an order form order for 100 skeins of the stuff in various colors is clipped to the front of his notes. Oh wait! Here's a match! Here's a pile of ashes that used to be an order form! Here's a spider web coated with order-form ashes! And here's a Really Annoyed Giant Spider waving eight lethally sharp objects! I guess I shall post the remaining photos and leave him to sulk, surrounded by Ninja Stars, RPG, and flamethrower. Thanks to Ravelry, Finland has been much in my thoughts this last week, as I have been exchanging emails with a lovely knitter in Finland named Marjut (whose website is here). At one point, I idly asked her about the State of Knitting in her country. To my delight, she sent back a thoughtful, insightful, and fascinating essay, which I thought I would share with you guys. NOTE: If you start clicking on the links in the article, please do NOT blame me if you suddenly need postage rates from Finland. It's her fault, not mine. No! Hers! I’m lucky to live in Espoo, the second biggest city right next to our capital Helsinki. I have a lot of possibilities when it comes to yarn shopping as there are many yarn shops around. Not all the people in Finland have yarn shops this close but there are more and more great online shops. I think the yarn shop business can be divided into three categories. First, there are the shops I could call dinosaurs in a respectful way, the brick and mortar shops that have been around for ages. It does not matter whether knitting is trendy or not because they have enough regular customers to keep the business alive. They usually sell good reliable yarns from good reliable brands, some domestic but mostly imported ones. I’d guess the yarns are mostly Nordic or European. They’re mostly made of wool, cotton, alpaca and other natural fibres or they’re at least blends, very rarely they’re 100% acrylic. To mention just a few brands, the first ones that come to my mind are Garnstudio, Gjestal, Istex, Grignasco and Schoeller & Stahl. The shops might also carry something fancy and trendy from eyelash yarns to other novelty yarns and luxury yarns such as cashmere and silk (blends). If the public demands and the yarn shops get good deals, they may also add new brands, like Rowan, to their selection. The shopkeepers usually know a lot and have gained a lot of experience throughout the years. They might even have the next generation working in the shop now. While some of the dinosaurs don’t even have web sites, some of them have moved on. They’ve started selling Debbie Bliss, Colinette and Noro and yarns made of exotic fibres like milk and soy as well and they have online stores. Secondly, there is the Internet generation, the young women who know foreign online yarn shops and the different lovely yarns from abroad. They realised that no one is importing those yarns to Finland so they decided to do it themselves and during the last year or two they have opened many online shops. They don’t always have brick and mortar shops (some do and some don’t), but they do go to fairs or such events so you can go and fondle the yarns. They sell luxurious sock and scarf yarns, SWTC, ShibuiKnits, Malabrigo and many American yarns and bring on the new yarns as soon as they can. They also like to cooperate with the Finnish online knitting magazine Ulla which I appreciate very much, being one of the founders and the editor in chief. Ulla is the Finnish equivalent of Knitty, made by Finnish knitters for Finnish knitters. The first issue was published in 2004. Thirdly, we have Novita, formerly known as the Helsingin villakehräämö (Helsinki wool spinnery). Novita practically dominates the Finnish market, you can get the yarns from every supermarket that sells yarn and their most famous yarn 7 Veljestä (7 brothers, named after a famous Finnish book by Aleksis Kivi) is even on the Ravelry top 100 list. Novita has recently launched three new luxury yarns, an eco(ish) wool yarn Stone, a wool and silk blend Wind and a wool and bamboo blend Cloud. That’s really an improvement. Then, of course, there are small spinneries, such as Pirtin kehräämö and Ylistaron kehräämö that buy wool from the local sheep farmers and spin their own wool yarns. You can also send your own wool there to be spun. I almost forgot Wetterhoff and Vuorelma, two corner stones of the Finnish yarn business. Wetterhoff was founded by Fredrika Wetterhoff as a handicrafts school in 1885. It is still a school and much more. In the shop they sell yarns for knitting, weaving and other handicrafts. Vuorelma was founded by Helmi Vuorelma about 100 years ago and they also sell yarns for knitting, weaving and other crafts as well as the Finnish national costumes or supplies for making them yourself. There are also some really cool indie dyers. First there was the Kool-Aid frenzy after which people moved on to acid and reactive dyes and some started selling their hand-dyed yarns. We have Ilu, who sells Handu yarns. We have Villa Mokka who sells Mokkasukka sock yarns in her yarn shop, you can see the recent colours in her blog. We have Juuli who recently opened an online store Naurava Lammas (The Laughing Sheep) and sells fibres for spinners also. We have Utuna with an ecological touch, the owner has her yarn spun and dyes it herself. There’s also Tuulia who lives in the USA, designs knitwear, spins and dyes yarn and who has a small Etsy shop. The indie business is small but very much admired among the Internet-savvy knitters and knitbloggers and I probably forgot many dyers anyway. I can’t think of anything as traditional and well-known knitting patterns as, for example, the Icelandic and Norwegian sweaters or the fishermen sweaters. Of course, there are some traditional sweater patterns. The Jussi sweater for men comes first to my mind but it’s actually quite a new design from the early 1920’s. There’s the partly knitted and partly crocheted Korsnäs sweater (from a place called Korsnäs) for the masochistic knitters and the tikkuripaita from the west coast and archipelago area. (“Tikkuri” is the part with a different pattern under the collar. Only that section was decorated because it was the only part you could see if you wore a coat). The Finnish knitting patterns are pretty much the same as the Nordic or Baltic ones as there has been cultural exchange all along. Knitting came to Finland in the 17th century from Middle Europe through a nunnery in Naantali, before that the naalbinding technique was used. Sock knitting was an important trade then. First men knitted the expensive luxury socks for sale, but when knitting became more of an everyday thing, it moved on to women. In addition to socks, people knitted mittens, sweaters and scarves, later also cardigans and spun their own yarn. Knitting was seen as a virtue, a good housewife knitted all the time, no matter where you were. Today both girls and boys are taught to knit in the first grades of school but few men knit. We did not knit as lovely lace scarves as the Estonian knitters but we did some nice colourwork. There’s an old mitten book Sata kansanomaista kuviokudinmallia (100 folk coloured knitting patterns) from the 40’s that was recently re-published due to high demand from the Finnish knitters. One knitter found the then out-of-print book from an used books store and blogged about it, the others got excited and started e-mailing the publisher and finally the book was republished. 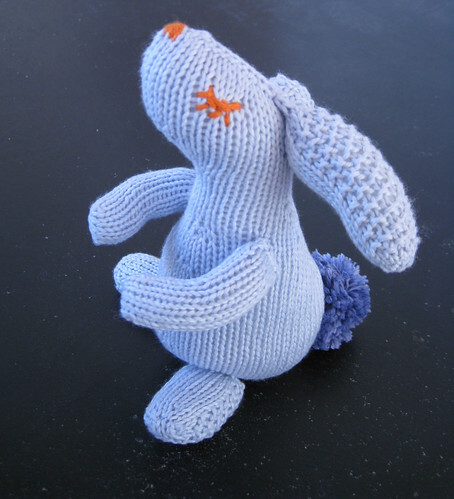 It includes 100 mitten patterns collected mostly from the east and west coasts. The new generation has also published knitting books which are not all about instant gratification. The authors of Punokset puikoille, Kristel Nyberg and Johanna Koski, started by designing knitting patterns for Ulla and due to the huge public demand (from friends and buddies also) they published a book. Another internationally known Finnish knitter and knitblogger is Tikru. She first published the GreenGable cardigan pattern in her blog, people loved it, talked a lot about it and then Vogue Knitting found it in Ravelry. It was published in the Fall 08 issue. *This means either "40 girls," "40 tribes," "imperishable", "inextinguishable" or "undying," depending on whose doing the translation. ** This means "Do you speak English? in Finnish. A handy phrase to know if you can wrap your mouth around it.